Over two decades ago Mehron pioneered the original concept of a smooth "whipped" Clown White formula. 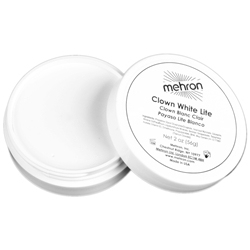 Mehron's Clown White Lite is a lanolin-based, highly pigmented Clown white that provides maximum whiteness yet can be used sparingly - thus the term "Lite". Applications: 7-14 full faces per ounce. Available Sizes: 2oz. and 8oz.